Dancing is my fuel and there’s nothing like getting lost in sensation as I move. Interestingly, dancing means so much more to me than just moving…I learn a lot when I’m on the dance floor. How I move in dance (and how I feel as I move) reflects how I’m moving in my life. Dancing inspires me and challenges me; it keeps me excited about living and experiencing my life. Not bad for an hour’s worth of play with awesome music playing in the background, right? 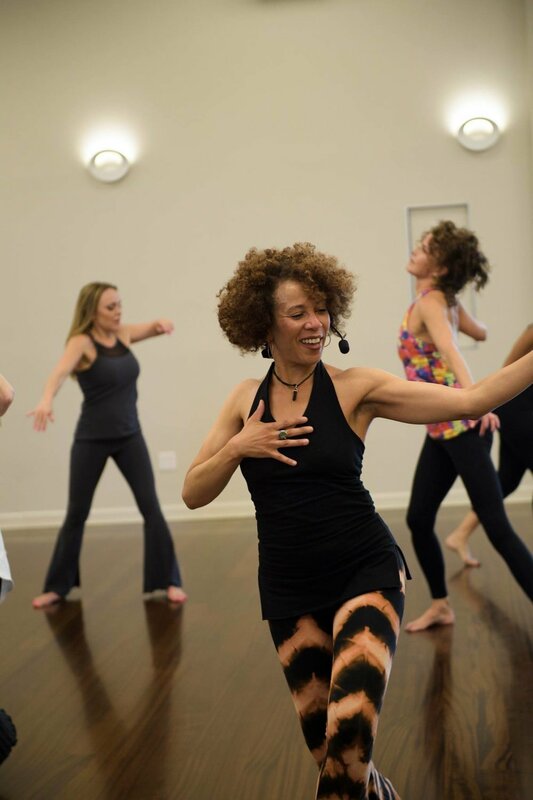 Conscious Dance Lab is a class that’s inspired by various forms of movement including "Dance The Untitled Self", Body Mantra, Trance Dance, my experiences at Rhythm Sanctuary, and my biggest inspiration of all...Soul Motion. These all are dance forms based in free-movement. Conscious Dance is a movement modality that anyone, regardless of skill or experience, can participate in. The intention isn’t to “dance well” or to dance like everyone else; there is no choreography. Conscious Dance is about connecting with and exploring how YOU move and discovering your own dance. It’s about moving fully and honestly in the moment. And the best part is that you’re dancing with a supportive, playful group of people who are having similar experiences. How great is that? Dance YOUR dance! My movement experience includes: Four years of dancing in Soul Motion (including receiving a certification as a Soul Motion Leadership graduate), a White Belt Nia certification, 11 years of ballet training, and participation in various movement forms including show choir, aerobics, African dance, belly dancing, tango, and Body Mantra. These movement forms, coupled with my 20 years of experience as a massage therapist and eight years of experience as a breath coach, have helped me to develop a solid life practice of body awareness. Through using body awareness, I use how I feel in my body to inform how I approach my life. It’s truly important because it keeps me honest with myself. I’m dancing my dance! Come move with me on Fridays (February, April, June, August, October, and December) from 6:30-8:00pm at Dancing the Soul, 950-C Jersey St. Denver, Colorado 80220.